Google just launched the series of new products in its flagship phone. 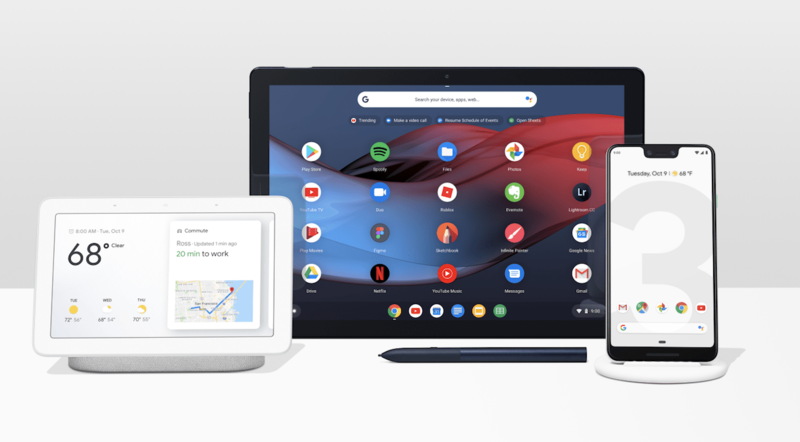 Google just unveiled the Pixel 3, Pixel 3 XL, Google Smart Home Hub & Pixel Slate. Google Pixel 3 & Pixel 3 XL is two new flagship device of 2018-19. The phones will come with Qualcomm Snapdragon 845 Processor with Pixel Visual Core, Adreno 630 GPU and Titan M security module, 4GB of RAM with storage option of 64 GB & 128 GB, Dual front-facing stereo speakers, Aluminium frame + hybrid coatiGorillaorill Glass 5 on both front and back, 2915 mAh battery with 18 W fast charging, USB Type-C charger and Qi wireless charging. The Phone runs on Android 9.0 Pie, 12.2 MP dual Pixel rear camera, 1.4 μm, dual pixel phase detection, OIS and f/1.8 aperture. On front, it has 8MP wide-angle and Telephoto camera with f/2.2 aperture. The Pixel 3 comes with 5.5” Display with 18:9 ratio while Pixel 3 XL comes with 6.3” FHD display with 18:5:9 ratio. Google Home Hub is the newest member of the Google Home family. It features a beautiful design with 7” floating display on top. With Google Home Hub, now you can see all the Google Assistant task in visual manner just like in your phone, watch videos, control & view the nest cameras and when it’s not in use, it’ll display the photos from Google Photos. The display will always On during the day time and turn off automatically in bed time. Google Home comes with Price of $149.